Colombia has eradicated the first of many coca plants the government vowed to replace by legal crops. Drug trafficking groups have already begun to violently frustrate this. 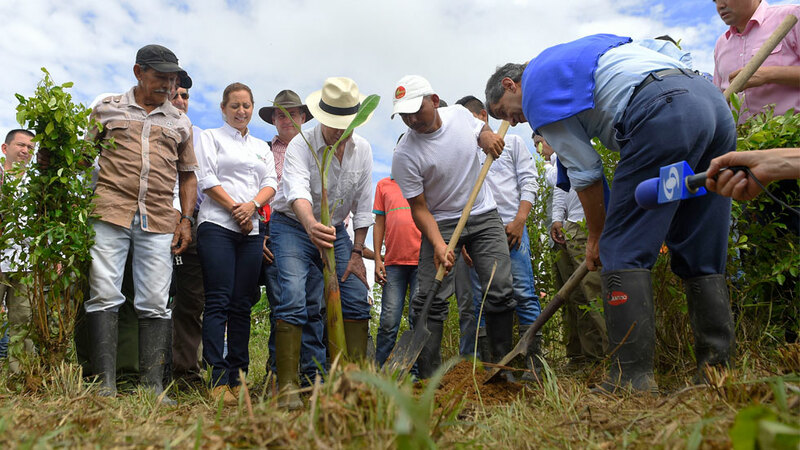 President Juan Manuel Santos on Thursday formally eradicated the first coca plant in La Uribe, Meta, until last year one of the main territories of the FARC, the country’s largest and demobilizing guerrilla group. The 53-year-old Marxist group has vowed to help eradicate the coca and remove the landmines protecting the fields as part of a peace agreement reached in November. Additionally, the program receives assistance from the United Nations Office on Drugs and Crime (UNODC). During the first of the two-year voluntary crop restitution plan that is part of a peace deal with the former guerrillas, the government said it would eradicate 50,000 hectares of coca fields. This is approximately three times as much as was forcibly eradicated last year and almost a quarter of Colombia’s total coca cultivation area, based on statistics by the United States. 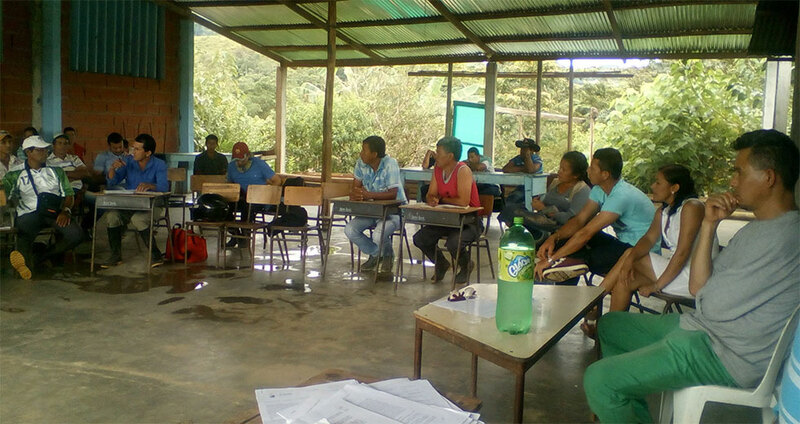 Over the past year, Colombian officials government and UNODC employees have been negotiating with coca growing communities to get them behind the voluntary program. According to newspaper El Tiempo, more than 80,000 coca growing families, responsible for the cultivation of almost 34% of Colombia’s total cultivation, have already agreed to take part in the program. All Colombia’s coca farmers have until July 10, 2019 to take part in the sponsored crop substitution program. After that day, the government said it would resume forcibly removing remaining coca fields without incentives. However, not all coca farmers are easily convinced, either because they do not trust the government or because they are threatened by drug trafficking groups not to take part. The government comes and tells us they will come with solutions so we don’t have to grow coca, but go and look for yourself and you will see that the money they promise possibly isn’t enough and we don’t know if they are going to keep their word. Exactly a year ago, the government, the FARC and the UN began a pilot project of the agreed crop substitution plan. However, by February, not one leaf had been removed. The project even had to be suspended in March after coca farmers rose up because, against made promises, the military had also begun the forced removal of coca. Additionally, the removal of landmines proved to take longer than expected and paramilitary group AGC — also active in drug trafficking in the area — has been terrorizing the locals, unimpressed by either the military, the national authorities or even the United Nations. The program is not without enemies. Illegal armed groups of all sorts have taken control of former FARC territory and are violently opposing communities’ participation or authorities’ attempts to assume public order and security. Dissident FARC guerrillas kidnapped a UNODC employee earlier this month in Guaviare, the province south of Meta, while more than 33 rural community leaders have been assassinated since the November peace deal, mainly in former FARC territory. In some cases, the drug trafficking groups act so quickly, coca growers barely have time to consider taking part in the program. 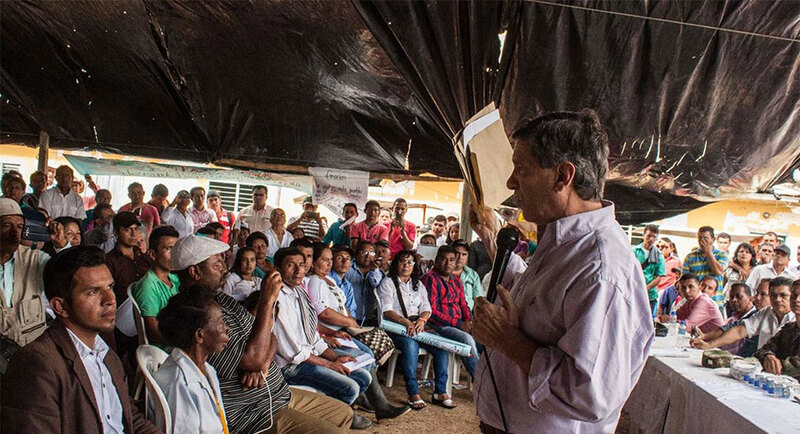 For example, Post-Conflict Minister Rafael Pardo personally went to the southern border town of Puerto Leguizamo, Putumayo last week to explain the plans to improve infrastructure, substitute crops and regulate land titles that would allow locals to switch from coca to legal crops. The next morning, the local coca growing communities found pamphlets on their doorsteps in which an unidentified group made it clear that they, not the government, are the ultimate authority in the coca-rich region. 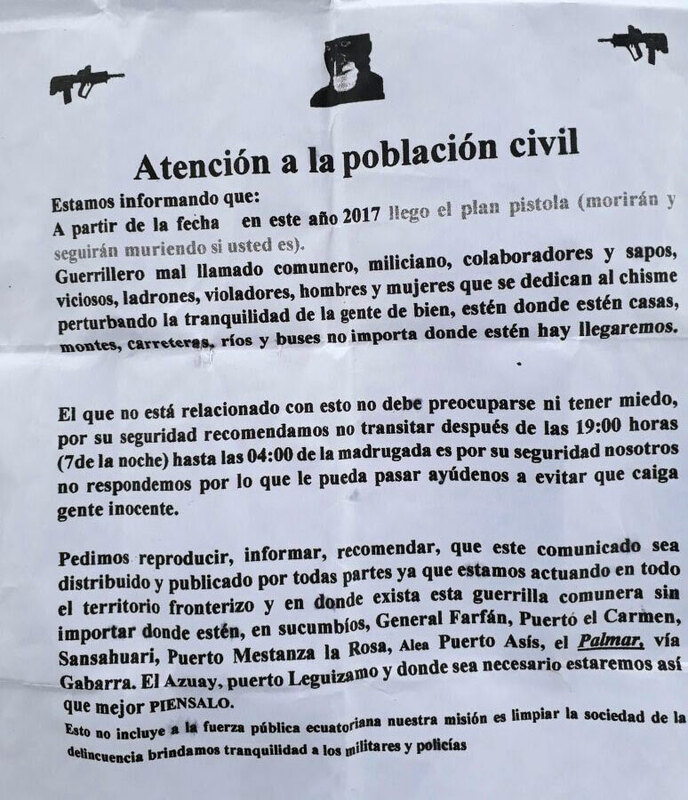 The threat spread in Puerto Leguizamo the day after the visit of Post-conflict Minister Rafael Pardo. “We will be active along the entire border region where ever there are guerrilla community leaders, no matter where they are … We will be there where ever necessary. Better think about it,” the pamphlet said. Since Colombia’s peace deal took effect on December 1, two of local community leaders have already been assassinated in the region. 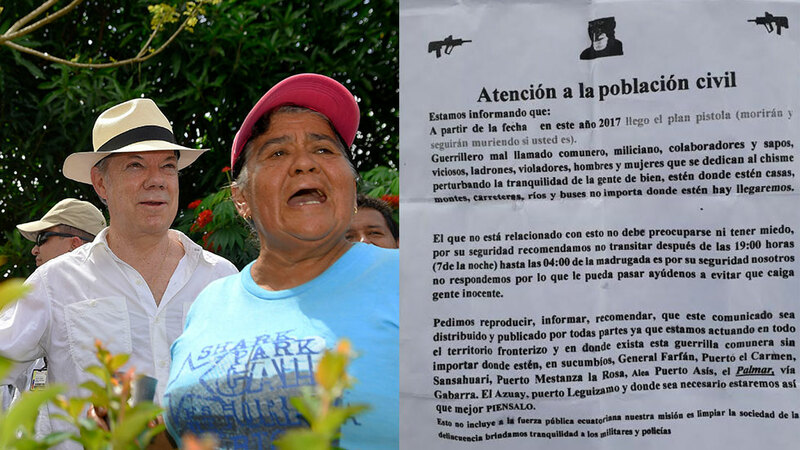 In La Uribe, where Santos eradicated his first-ever coca plant, locals were told in a pamphlet signed by presumed FARC dissidents they had “taken the decision to desist from the so-called peace process and to continue fighting, according to RCN Radio. Four days later, the alleged guerrillas kidnapped the UNODC worker. In the same area, allied paramilitary groups AGC, Bloque Meta and the Libertadores de Vichada are also active in drug trafficking, allegedly in collusion with “Puntilla, ” an alleged drug kingpin who was recently and surprisingly released from jail. Colombia’s estimated $1.5 billion drug trafficking industry has corrupted every actor in the armed conflict, including the security forces. This corruption is widespread and goes so high up the hierarchy to the point it distorts the line of command and is reportedly even leading to attempts to actively frustrate the process. Just weeks ago, recordings leaked from alleged members of the military stationed near La Uribe trying to bribe demobilizing guerrillas to abandon the process, effectively relieving the rebels of their obligation to assist in the crop substitution program. Will a soft approach yield results? The US-led “War on Drugs” has long lost support in Latin America and beyond. Even within the US, repressive counter-narcotics policies are increasingly challenged by individual states. Colombia banned Washington DC’s preferred method, aerial fumigation, after a series of issues. First, the spraying spurred an abundance of complaints from farmers claiming the practice was not killing coca, but all crops, and causing illnesses. Ecuador then won an international lawsuit at the International Court of Justice, which banned the practice within 10 miles from the border because of the alleged health effects. The death blow was given by the World Health Organization, which designated the used chemical as potentially carcinogenic. Following the UN’s recommendations, the Colombian government has linked its crop substitution program to far-stretching rural reforms, which would increase the chances of success. However, if the state continues to fail to guarantee public security in the country’s coca-growing regions, not just the new counter-narcotics strategy, but the entire peace process could fail.